Synopsis: Jack Reacher goes on the run with an army major in order to clear his name and uncover a government conspiracy. 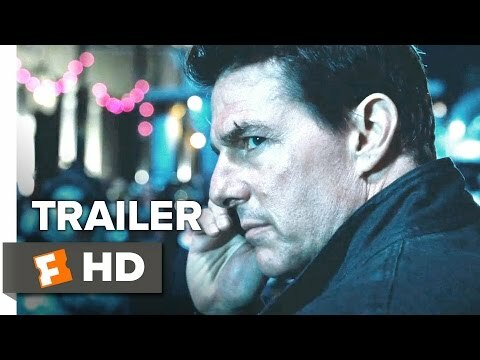 Four years after his first appearance in the role, Tom Cruise (Edge of Tomorrow, Mission Impossible – Rogue Nation) returns as mysterious ex-army drifter, Jack Reacher. The world might not exactly have been holding its breath for the next Reacher Feature in the interim period, but the first movie was a promising enough action thriller, raising hopes that it perhaps marked the birth of a superior franchise. Sadly, while Jack Reacher: Never Go Back isn’t a terrible movie, it falls far short of even the modest benchmark set by its predecessor. A lot of the teaser trailers on TV feature the diner scene in which a handcuffed Reacher promises his arresting officer that within 90 seconds he will be the one in cuffs and under arrest. It’s an intriguing little scenario, but has nothing to do with the rest of the movie, merely serving instead as a means of connecting Reacher with Major Susan Turner (Cobie Smulders – Captain America: The Winter Soldier), the military contact with whom he coordinated the arrest he just predicted. When Reacher pays a visit on Turner at her offices, he’s surprised to be greeted by a burly officer named Morgan (Holt McCallany – Concussion, Sully), who informs him that Turner has been placed under military arrest for treason, and has left express instructions that Reacher is not to contact her – an instruction which conjures up the words rag, bull and red. The surprises the day holds in store for Reacher aren’t over yet, though. When he corners Turner’s lawyer, he’s met with the expected stony refusal to divulge any information; less predictable, though, is the somewhat bizarre news he delivers that Reacher has been named as the father of a fifteen-year-old girl whose mother is suing the army for back-payment of maintenance. The following day, the previously uncooperative lawyer has an unconvincing change of heart, and decides to paint a target on his back by providing Reacher with information vital for the progression of the film’s plot. Suspecting a cover-up and conspiracy that places both his and Turner’s lives in danger, he immediately springs her from prison – after first being arrested for the lawyer’s murder – and then hooks up with his maybe-daughter, Samantha (Danika Yarosh), a street-smart kid with a chip on her shoulder the size of a chip. Immediately engaging in the arguments and strained silences typical of any family unit, the three fugitives follow a breadcrumb trail of clues to an eventual showdown in New Orleans with a paid assassin known as The Hunter (Patrick Heusinger). The overwhelming impression given by Jack Reacher: Never Go Back is one of sloppiness. The plot fearlessly ignores logic and defies realism as it negotiates countless short cuts in its haste to reach its rather ordinary conclusion. A few examples: How does Reacher know the mobile number of a female military guard with whom he has exchanged maybe half a dozen sentences? Why does the jacket worn by 6’1” Aldis Hodge (The Ladykillers) fit 5’7” Cruise when he steals it from him? Why is the lawyer who’s defending Turner carrying around a file on the paternity suit against Reacher? And why is Reacher even named as the father if the woman Samantha claims is her mother fails to recognise him? These are mostly minor issues, it’s true, but they’re glaring ones that pull you from the picture. The action sequences are competently handled by director Edward Zwick, and Cruise still makes a likable leading man, even if he is a little long in the tooth for these kind of roles. In fact, the movie is entirely watchable, but it’s also entirely forgettable, making the likelihood of a third installment fairly remote.